Rendering courtesy of client, Forest City. Its exciting to see the Ballston Quarter redevelopment nearing completion and already getting recognized for the forward thinking strategies focusing on the public realm. Mahan Rykiel worked closely with the owner and architects to develop a new public space and gateway to the repositioned Ballston Quarter project, with an emphasis on exciting forms, a variety of seating spaces and a focus on the user experience. 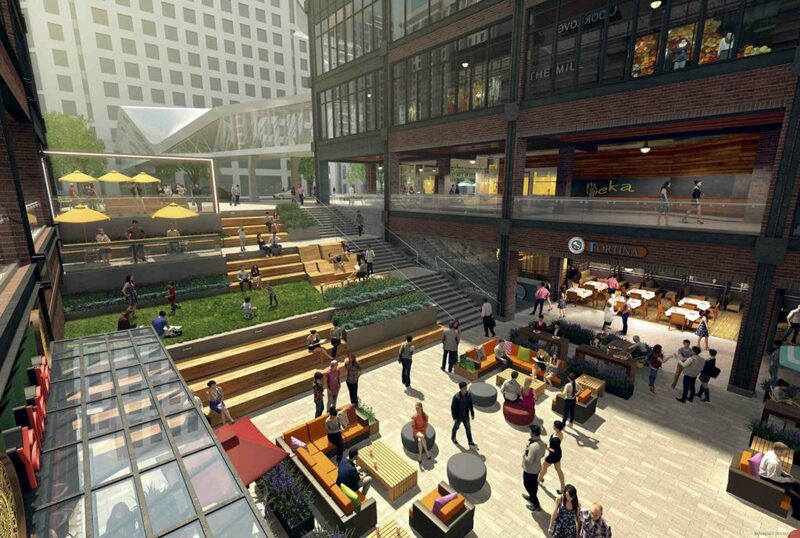 Once completed, the plaza space is envisioned to become a unique destination in the ever-changing Ballston area. The main focal point of the project is the sunken plaza, which is designed for events, gatherings and informal dining. At its pinnacle is a dramatic overlook, which anchors the project to Wilson Boulevard. This space leads to the mews, which is a new, day lighted portion of the mall that has been designed to replicate a shopping street. The overall aesthetic of the project emphasizes “old meets new”, with contrasting forms, materials and spaces that create visual interest. We enjoyed working with CRTKL, the design architect; Cooper Carry, the architect of record; and Landscape Architecture Bureau, the landscape architect of record.